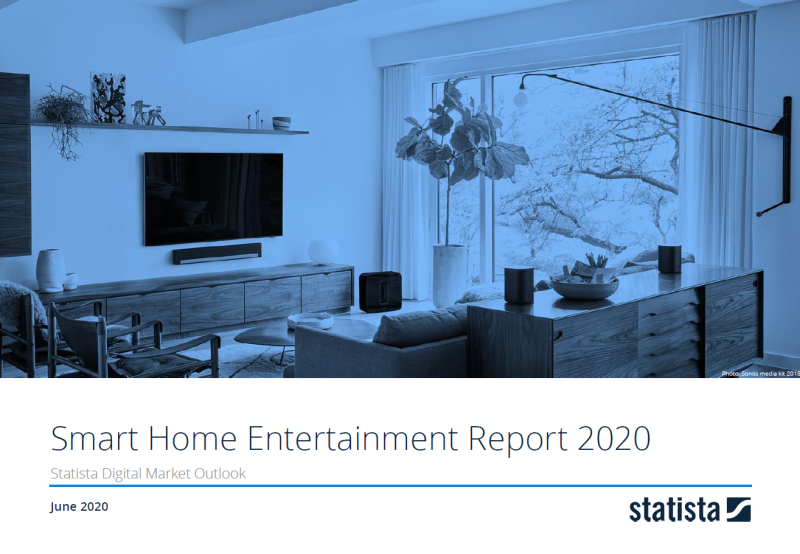 Revenue in the Home Entertainment segment amounts to US$10,827m in 2019. Revenue is expected to show an annual growth rate (CAGR 2019-2023) of 13.2%, resulting in a market volume of US$17,793m by 2023. Household penetration is 3.3% in 2019 and is expected to hit 7.8% by 2023. The average revenue per Smart Home in the Home Entertainment segment currently amounts to US$176.98. A global comparison reveals that most revenue is generated in United States (US$4,346m in 2019). The Smart Home segment Home Entertainment comprises the sale of products and services for multi-room entertainment (e.g. sound systems) as well as connected remote controls and streaming devices (e.g. Amazon Fire TV stick, Google Chromecast). General, freely programmable buttons and switches (see Control and Connectivity) or light bulbs for different lighting scenarios (see Comfort and Lighting) are not included. Smart TVs are also not considered here because their functions are, in most cases, not directly controlled via the Internet but networking is primarily used for the retrieval of media content. Integrated Smart Home: A single occupant home or households in multi-unit dwellings that are equipped with a central control unit (gateway) which is connected to the Internet and from which a large number of networked devices can be connected with one another. Integrated Smart Homes use devices from at least two market segments. In this segment integrated Smart Homes are Households with Home Entertainment devices and connection to other segments (e.g. Multiroom speaker with interaction to outdoor motion detectors). Stand-alone Smart Home: An isolated application that does not necessarily use a central control unit, serves a single purpose and can be directly controlled (e.g. via a router) from a smart device. Included are all Smart Homes with only Home Entertainment devices without connection to other segments (e.g. only a multi-room speaker system). Reading Support Revenue in the Home Entertainment segment amounts to US$10,827m in 2019. Reading Support The Home Entertainment segment is expected to show a revenue growth of 14.6% in 2020. Reading Support In the Home Entertainment segment, the number of active households is expected to amount to 150.5m by 2023. Reading Support Household penetration in the Home Entertainment segment is at 3.3% in 2019. Reading Support The average revenue per active household in the Home Entertainment segment amounts to US$176.98 in 2019. Reading Support In the year 2017 a share of 38.0% of users is 25-34 years old. Reading Support In the year 2017 a share of 61.4% of users is male. Reading Support In the year 2017 a share of 48.8% of users is in the high income group. Reading Support With a market volume of US$4,346m in 2019, most revenue is generated in United States. Reading Support With a rate of 19.7%, the household penetration in the Home Entertainment segment is highest in United States. Here you can find more studies and statistics about "Home Entertainment".